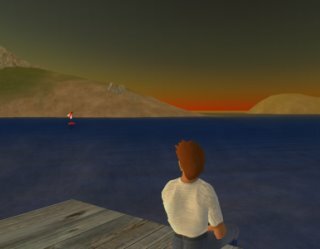 I have no idea what the allure of Second Life is. No freakin' clue. BUT I CAN'T LOOK AWAY. Maybe it's the convergence of user created content in a massively multiplayer world. Maybe I just want to show props to someone who's willing to launch a Linux client. Maybe I'm interested in something that has its own self-contained scripting language (which is pretty damned cool). Maybe. But for some reason I'm content to sit on the docks and watch the sunrise over a lake. And sometimes watch a helicopter out of control go spiraling by. Why? I have no freaking clue.